Hyaluronic acid (HA) is a naturally occurring substance in connective tissue that works to cushion and fill spaces between the cells. Like many other substances in our bodies, hyaluronic acid depletes with age. 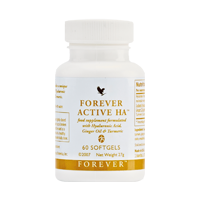 Forever Active HA provides you with a unique form of low molecular weight HA plus ginger oil and turmeric roots. N.B. Contains soy. Soy bean oil, gelatin, humectant (glycerin), hyaluronic acid complex, turmeric, ginger oil, stabilizer (yellow beeswax), maltodextrin, purified water, zinc oxide, emulsifier (soy lecithin). Allergy advice: for allergens, see ingredients in bold. Keep out of reach of young children. Store tightly closed in a cool, dry place. Do not use if seal is broken or missing. Food supplements should not be used as a substitute for a varied and balanced diet and a healthy lifestyle. If you are pregnant, breastfeeding, planning pregnancy, taking any medications or under medical supervision, please consult a doctor or healthcare professional before use. Do not exceed the recommended daily dose.